Serious production of the event: people that take care of me (us) as guests as well as as performer(s). Serious advertisement of the event, so that the interested public knows about it. A silent sleeping place (including bed, sheet, pillows, blanket! ), shower and breakfast (private accomodation ok) for me and my possible fellow travelers. The private room should be able to be locked, and also have a towel and a table with a chair. Internet access would also be good, wireless or ethernet with a cable. Hot meal if I'm alone, or cooking possibilities (like a kitchen) if I travel with others. Normal fee: 8.000 SEK (see current exchange rates) + per diem ("traktamente") and travel. Travel money can possibly be applied for from Swedish institutions with a written invitation in good time. Please feel free to contact me for negotiations about economic possibilities, however. Set-up time: about 2 hours, including sound check. Clearing time: 5 minutes to get off the stage if someone helps me, 45 minutes for complete packing. Floor surface minimum 2x2 m.
Stage lighting, in order for me to see my things and be visible for the audience. PA-system with stereo inputs (from my own mixer), preferably a PA with sub-bass. Possibly one microphone stand with an arm (if I use my own voice microphone). Possibly 1-2 condenser microphones for acoustic sounds (depending on the acoustics and size of the hall). This depends on if I bring acoustic instruments at all. Possibly 1 stool (or chair, preferably without arms). A table, normal height, minimum 110x85 cm (size negotiable). Possibly a singing (musical) saw if available, otherwise a large, not rusty, hand saw. 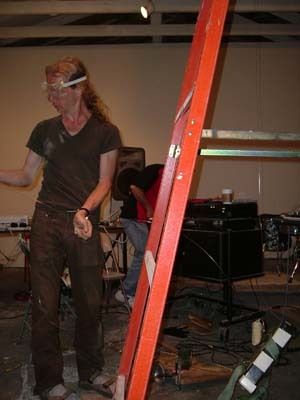 If I come by surface transport, I sometimes bring my own saws – it depends on the type of concert. Recording of the event, audio (preferably digital, 48 kHz/24bit) and video (preferably digital) for documentation. Please be ready to give me a digital copy of the sound file asap after the gig. Possibly a digital projector. It's needed if it's a big room/large audience with limited possibility to see my table contents, if I'd like to use my forehead spycam with rca (“japanese”) video output so the audience can see what I see. Silent atmosphere (no active noisy drinking bar or café where people don't come for the performance). For North America or other places with 120 V currrency, it might be good to provide a mixer similar to Mackie 1202, (or I'll bring a converter). If possible, borrow a Micro Moog or similar analog synthesizer. 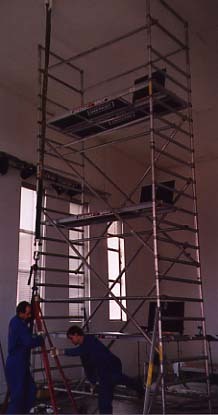 Scaffolding built up in Stavanger 2002 to test the security of the hooks in the ceiling. Set-up time: about 2 h, including sound check. 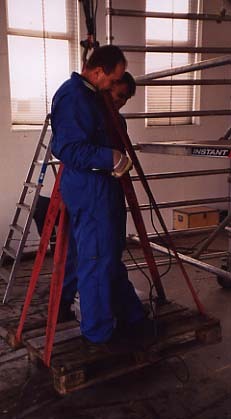 Clearing time: quickly between sets, the instrument can be pulled to the side with a rope in 3 minutes; full clearing about 40 minutes (ladder and clearance from people mentioned below are needed for this as well!). Height of the ceiling / pole above the floor: at least 6 m, preferably 8. 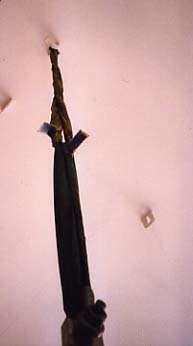 Ladder for ceiling work (first for mounting the strings, then a lower one, possibly a chair, for climbing the instrument before and after playing it). Clearance from people is needed for security reasons when I work with the strings, since injuries can happen quickly and be serious (destroying eyes e.g.!). 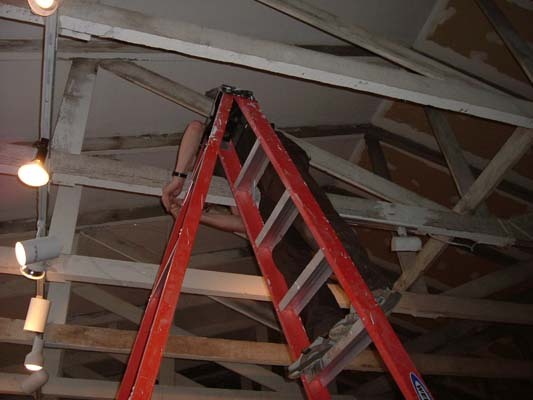 Existing poles, tubes etc. in the ceiling or a corresponding high point (even outdoors) are the easiest solution, if they hang out at least one meter from any wall. PA with sub-bass (important for good sound!) with ordinary Canon ("jack", "tele", "quarter inch", 3.5 mm) input close to stage or a DI box on stage. The Stringed Stirrups are amplified with a built-in contact microphone, so no need to worry about mikes. Monitored hearing on stage, that can be well heard from my hanging/playing position. 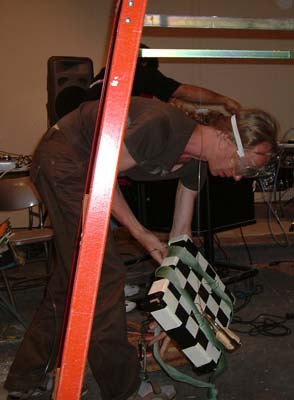 Measuring and cutting the piano wire for a gig in Oakland, wearing security goggles. One or two mild lamps, no colours, to light up the coffin from the outside. Podium built for the Singing Coffin at Arvika Festival. One very small lamp, possibly flashlight, that I hold when I am lying in the coffin, and is lying in the coffin when I am pausing. It lights up my face from the inside. 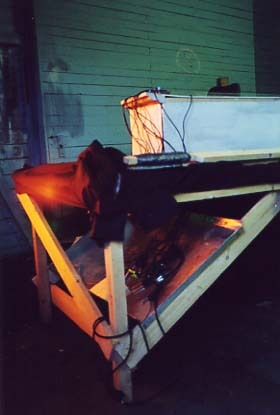 No amplification is basically needed, the coffin sounds by itself. However, if the atmosphere is very noisy, an extra amp is needed. An electric chord with two outputs is needed at the coffin, one for my own mixer (230 V), one for the small lamp (if not flashlight). 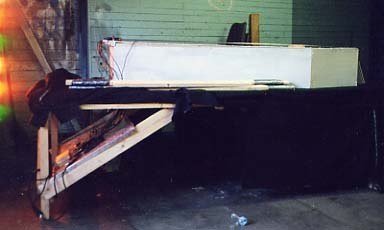 The coffin should stand on a podium which should be black, wooden or white, which is larger than the coffin and has room for the mixer by the foot end. Height: 80 cm, width min. 100 cm, length min. 260 cm. Costs for materials: none, if you can arrange the podium. Playing location: indoors or outdoors where people are passing by, if there's some room and space around, and not too disturbing noises around. At heavy rain, I should move inside. Two people (preferably four) should be able to move the podium with everything, after the chords are disconnected. The mixer must always be covered by something rain- and theft proof! It could also be a stage act, but then about 15 minutes. Security: I must be protected by vigilant guards at all times, since I am quite helpless and I have noticed that many people feel provoked by my singing in the coffin and can, for some reason, become violent! Otherwise I welcome communication with friendly spectators, who can also interact with me if they wish. A special room for the mixer under the foot part of the coffin. 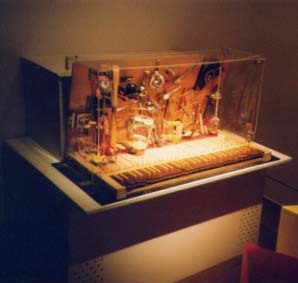 The Kaleidochord, from the Croydon exhibition (with glass and with the table built especially for it by the exhibition team). Size about 52 x 110 and 50 cm high, it should be mounted on a table minimum that size. The transparent plastic sheets to protect the action are screwed into the table. Amp needed, small mixer needed. The mixer needs 5 inputs from the Kaleidochord. I'll do the levels and eqs when I install it and then it's just left on all the time, or turned on when the gallery opens. The speaker(s) should be in front of the ears of the player so it doesn't become too loud for the environment. Basic principle is always: the player will hear a louder sound than anyone else! A macintosh computer equipped with AppleWorks 6 or higher, connected to a projector and screen for projections. Other equipment (Mackie 1202 mixer, minidisc player, voice microphone, computer for Max sound files) provided by myself. 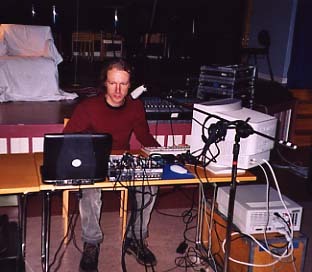 Setup for a performance in Linköping. Updated the 31st of July, 2013.